1 - What does the Homecrest Outdoor Living limited warranty cover in a commercial setting? Aluminum and steel frames are covered from structural failures for five years. Painted frame surfaces are covered against peeling, flaking or blistering for a period of five years. The fabrics used on our double layer slings and padded slings are warranted against tearing, discoloration or excessive fading for two years when maintained per the recommended care and maintenance instructions. Solid surface table tops (i.e. Natural Series table tops) are warranted against structural failures, finish cracks and blisters for one year. Vinyl strapping is warranted from discoloration or breakage for one year. Glider bearing hangers are warranted for one year against failure. Homecrest woven products are covered against fading, cracking and structural failure for one year. The fabrics used on our cushions, single layer slings, Airo2 and umbrella canopies are warranted against tearing, discoloration or excessive fading for one year when maintained per the recommended care and maintenance instructions. Crystal fire burners (24” round and 12” x 24”) are warranted to be free from defects in material and workmanship for a period of one year from the date of purchase. The warranty of the finish on coiled steel spring rocker mechanisms, plastic parts, flex plates, glides, swivel inserts, metal umbrellas, cord and umbrella base is warranted for one year from the date of purchase when products are maintained per the recommended care and maintenance instructions. All purchased slings, cushions and parts, etc. bought online through shop.homecrest.com or through a retailer carry a one year warranty from date of purchase. 2 - What doesn't the Homecrest Outdoor Living limited warranty cover in a commercial setting? Acts of God, falling objects, fire, explosions, external forces or any similar physical damage. Failure caused by misuse or lack of appropriate care and maintenance of the products. Refer to the care and maintenance instructions. Damage caused by caustic chemicals and/or power washers. Products shipped from the previous factory prior to 1/1/2008. Glass and acrylic table tops. Showroom samples and factory outlet purchases. Normal fading of fabrics, straps and painted surfaces. Bursting and cracking of tubing and extrusion caused by exposure to moisture and freezing temperatures. Return freight after one year. Salt water exposure. Due to the demands of salt air, weekly cleaning and quarterly waxing of painted surfaces must be maintained to prevent finish blisters and corrosion. Failure to carefully follow our care and maintenance instructions will void the warranty. 3 - What is the claims procedure? In the event that a warranty claim file needs to be opened, contact your local Homecrest retailer to facilitate the process. 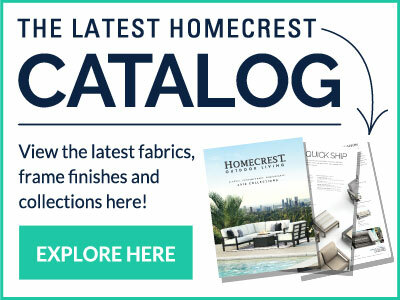 If a local retailer is not available, you may also contact Homecrest via our website by going to www.myhomecrest.com. Warranty for any refinished or replaced product shall be only for the remainder of the warranty period applicable to the original product. During the warranty process, you may be required to either return the defective merchandise, or provide proof of destruction. Working through your local retailer is highly recommended, when possible. Many of our retailers can fix and/or handle issues immediately, saving you both time and expense in the warranty process. 4 - What is the policy as it relates to freight shipping? All Homecrest furniture is delivered to the carrier in factory new condition. Claims for damage or losses that occur during shipping must be noted at the time of delivery and filed with Homecrest. Send written notice of the claimed condition to: Homecrest Outdoor Living, LLC, 1250 Homecrest Avenue, Wadena, MN 56482.